There are a couple of ways to begin this section. If the tide is low, you can drop down on to Lobster Jack Beach and do the interesting walk around the rock platform of Warden Head and on to Rennies Beach. 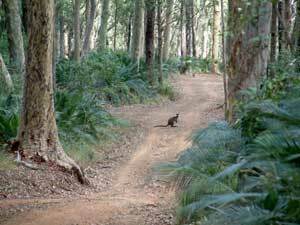 This then rejoins the alternative route, which is to walk through suburban streets to the South Pacific Heathlands Reserve, where a track will take you through an area of original coastal vegetation.The track emerges onto the soft sand of Racecourse Beach, which becomes your route to the entrance of Burrill Lake. At low tide this entrance is wadable, but there is a bridge a short distance inland which offers a dry crossing. Rounding Dolphin Point on the southern shore of the lake, you enter the Barnunj State Conservation Area to follow a long rock platform before crossing a jumble of sandstone boulders to reach the northern end of Wairo Beach. Framed by Tabourie Island and Mt Durras and the coastal forests of Meroo National Park, long sandy beaches stretch for 12 km southward, separated by sandstone headlands at Termeil, Meroo and Nuggan Points and by the estuarine wetlands of Meroo and Willinga Lake. This brings you to Bawley Point and its small wooden wharf. From Bawley Point you cross a series of small beaches, passing Brush Island just off-shore and the Murramarang Aboriginal Heritage area, where traces of its ancient inhabitants remain. 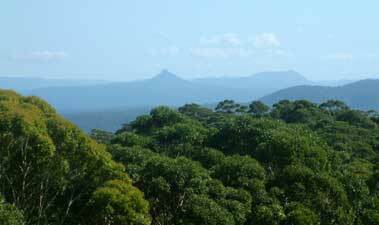 Durras Mountain now looms larger, as you cross Racecourse and Kioloa Beaches to wander through the casuarina and banksia forest of O’Hara Head. This brings you to Merry Beach and the start of the Murramarang National Park – the next few days walking will be through the diverse vegetation and coastal landscapes of this park. From Merry Beach, you wander around Snapper Head to take in the glorious views of Durras Mountain and your route ahead. Then, passing Pretty Beach, you climb up through lovely spotted gum forest and grassy clearings to the top of the mountain, before descending back through rain-forest to the coast at Pebbly Beach, with its mob of resident kangaroos. From Pebbly Beach, you edge your way past rock shelf, smooth-stoned beach and fine sandy beach to Depot Beach, another lovely spot in the heart of the National Park. The long rock platform around the base of Point Upright makes for a fascinating passage to North Durras, almost a time warp with its 1960s style beach-houses. Here the entrance to Durras Lake needs to be crossed, but can usually be waded at low tide and may even be blocked by a sand bar. Lake Durras itself provides a tranquil setting and, once on the southern side of the lake, the beach walking continues to Murramarang Resort, before heading inland to cut across though the forest to reach some of the more isolated and wild landscapes of the National Park. Crossing Emily Miller Beach, with its golden beach and sculpted sandstone rocks, you quickly reach Dark Beach, where the sand changes from gold to dark grey, as the rocks change from sandstone to metamorphosed chert and phyllite – fascinating geology. These metamorphic rocks form jagged cliffs and ribs as you continue south, at times in the forest and at times on the shore. Eventually, at North Head, you turn westwards to cross Pine Knob and reach the coastal village of Maloney’s Beach on the northern shore of Batemans Bay – time for a coffee at the local café. The walk continues along the cliff-top behind the houses to reach Long Beach. 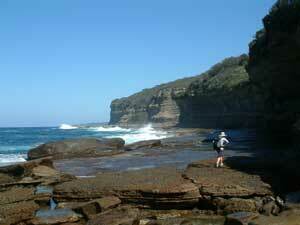 Here, it climbs over the forested point of Cullendulla Nature Reserve, to reach mangrove-lined Cullendulla Creek. This is best crossed at low tide when it can be waded, before continuing along the northern shore of Batemans Bay to reach the bridge over the Clyde River. On the other side is Batemans Bay, the largest coastal town south of Kiama, and a good place for a break. No track issues currently known.